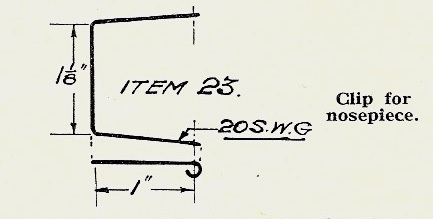 The rear motor hooks, item 15,can either be bent up from 16 s.w.g. piano wire or soft tinned iron. 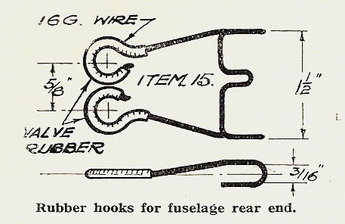 Bend from the centre first, and make the hooks last. 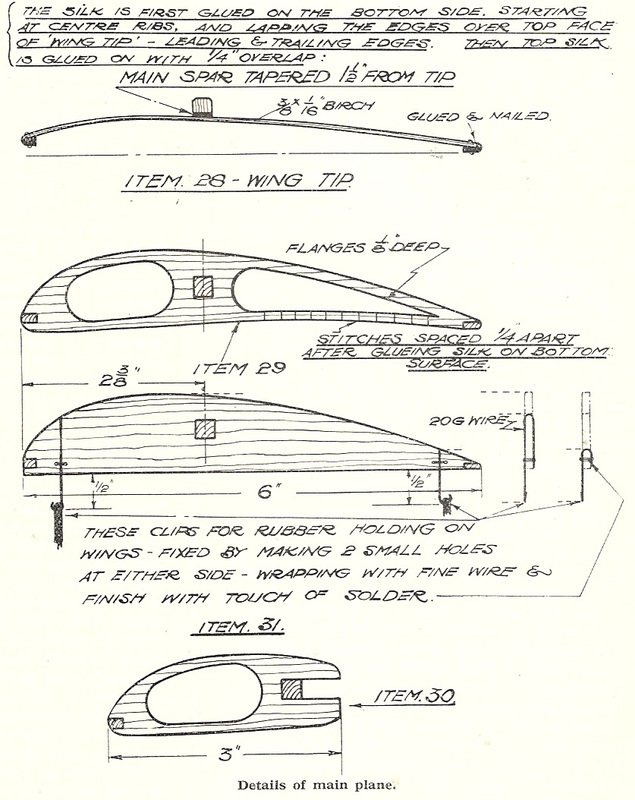 The wire nose clip can be made up, but not bolted in position until fuselage is covered and doped. silk with a discarded razor blade. in. to overlap. While doing this keep silk taut both lengthwise and across the wing, the latter, of course, at the tip. If it is not kept taut, especially from the leading edge to 3 in. back, the silk will fall hollow between the ribs, and the efficiency of the wing thereby reduced. Finally trim the loose edge off, allowing ¼ in. overlap beyond trailing edge. Glue under surface of trailing edge, and, with thumb and finger working from the centre, gently fold silk into place. Do not pull tight, especially between the ribs. An old safety razor blade, aforementioned, is an excellent instrument for trimming off ends and edges, for one can get in places with this where one cannot with chisel or scissors.